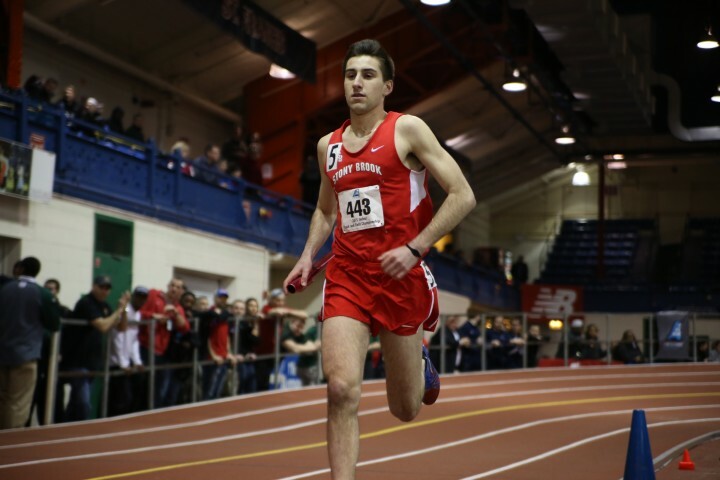 Stony Brook Men’s and Women’s Track and Field traveled to Boston for the America East Championships this past weekend. The men came in fourth place out of the nine America East teams, while the women finished in second. Avery, Connelly and Watts competed in the 5,000 meter on Friday. All three finished with faster times than Stony Brook’s previous record of 14:10.36, set by Tim Hodge in 2009. Connelly won the men’s 5,000 meter with a time of 14:05.17 seconds. Avery finished second with a time of 14:07.25 seconds, shattering his previous best of 14:49.20 seconds. Watts came in fourth with a time of 14:09.05 seconds. Watts competed once again in the men’s 3,000-meter run, where he captured the victory with a time of 8:20.25 seconds. His first-place performance was the top-ranked finish for the men’s team throughout the championship. Oviasogie finished the pentathlon with a score of 3,272 and Brooks recorded a 5.77-meter long jump, finishing in the top five. Stony Brook’s success continued on Saturday in the second day of the America East Championships. Junior Holly Manning won the women’s 1,000-meter, breaking the previous America East record with a time of 2:47.21. Her previous best 1,000-meter cameat the Valentien Invitational on Feb. 10 with a time of 2:44.83 seconds. Gordon took home the women’s triple jump at 12.56 meters. Junior Annika Sisson won the women’s mile with a time of 4:46.32 seconds. Senior Courtney Warden won the women’s 60-meter hurdles, clocking in at 8.55 seconds. Manning, Sisson, senior Tiana Guevara and junior Melissa Riback came out on top in the women’s 4×800 meter relay with a time of 8:58.19 seconds. Stony Brook will travel to the IC4A/ECAC Championships at Boston University March 2 through March 4. An earlier version of this story incorrectly stated that junior Annika Sisson won the women’s mile in 44:46.36 seconds. She won it in 4:46.36 seconds. It also incorrectly stated that junior Holly Manning ran her best time in the 1,000-meter run over a year ago with a time of 3:04.83 seconds. Manning set a personal best at the Valentien Invitational on Feb. 10 with a time of 2:44.83 seconds.